This past month my in-town book club chose to read The Four Feathers , by A. E. W. Mason. I was glad of it because I had never read it and was very curious. I've linked the title to the $0.99 edition which is available on the Kindle which I would also like to note as being the cheapest, fastest way to get a hold of it. I liked the book so much though that now I'm on the lookout for a beautiful hardbound edition. 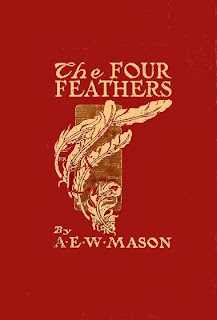 The Four Feathers was published in 1902. Although Mason wrote many novels (and plays) it is considered that this is his finest. Interesting to note, Mason was a contemporary of Anthony Hope who wrote The Prisoner of Zenda. (Linked to my review.) It was apparently a great time in history for adventure stories and these two titles most definitely ought to be enjoyed by a modern reading audience! The Four Feathers tells the story of British officer, Harry Faversham. Harry is engaged to be married to a young lady by the beautiful name of Ethne when his regiment is called to Egypt to help suppress an uprising. Harry doesn't want to go to Egypt. He has always been a sensitive soul and loathes and fears the idea of entering into battle and watching people be injured, maimed or killed. He can't seem to muster the courage to put himself in harm's way and so he resigns from his commission. As a result of his cowardly resignation, three men from his regiment send him three white feathers. Henry opens the package containing the feathers in front of Ethne who then learns of his cowardice. Upon hearing what he had done, Ethne presents him with a fourth feather and calls off their engagement. Feversham is sufficiently shamed and - after informing his father and a close friend of what all had occurred - disappears from society. Privately, Faversham decides to seek opportunities by which he will be able to ask each of the four individuals who presented him with the feathers to take them back, thus restoring his honor. This is a tale of bravery, courage, love, hardship, adventure and honor. The book was interesting from the perspective of that the way a reader would view different characters. Your thoughts and opinions about any number of individuals were apt to change while progressing through the story. I liked Harry and then I didn't. Then I liked him again. I admired other characters, but there were also times when I abhorred them. The only constant was that I did not care for Ethne (despite her beautiful name). I found her to be rather callous and self-centered much of the time. I wasn't able to attend book club for the discussion but it is my understanding that the generous consensus was that no one cared for Ethne very much. Others also expressed that their feelings changed towards various characters as they read along. The other nice aspect of this book is that there is a main plot and then a variety of subplots which manage to keep a tight reign on the reader's interest levels. New details and facts, thoughts and ideas are revealed as the story unfolds. My only complaint about the book is really that it started off rather slow (for me at any rate). The first few chapters were a struggle to get into but by the middle of the tale I was completely hooked and breezed my way to the end. I'm having a hard time finding much information or discussion about the book online. Even Wikipedia is brief in its description (gasp). Readers on Goodreads give it 3.84 stars out of 5. I'd give it 5 myself, despite its slow beginnings. Some readers noted that they didn't understand quite why it was labeled an "adventure" story as they found it to be more a study of feelings. I can see why they would say that. Much of the story is told by way of explaining a character or a situation and by sharing what they were thinking or feeling in any given moment. I understand too that because this book pretty much documents thought processes, it is a hard book to make into a movie. Critics seem to agree that there is not a faithful movie adaptation of the book to be found. (The 2002 version with Heath Ledger looks to be avoided at all costs.) After hearing other people's experiences with the films, I think I will leave The Four Feathers to my imagination. Although I don't feel very equipped to discuss this title - based on the fact that I can't find much online of the history of the book or A.E.W. Mason online - I'll bring this "review" to a close. I would be curious to learn more about it and probably the one and only way that will ever occur is if modern readers pick his books up and become interested in them once again. This novel is really quite brilliant in explaining the inner workings of the mind and how the way a person is thinking has great influence over their actions. If that sounds too brainy for you, I'll refer you again to the books classification as being a "romantic adventure story." The best book is the one that entertains you thoroughly while making you think a little as well. This is one of those "best books" and if you find yourself with an opportunity to read it, do! Note: The Kindle edition that I have linked to above ($0.99) includes several other of Mason's works which I plan to fully enjoy. The fact that it is a "story of feelings" rather than an adventure story makes me want to read it more. haha. I actually had already saved this one. I hadn't heard of it till Alicia mentioned it to me. I had never heard of the book or the author, but I ordered it on the Kindle. Odd that there is only one review of it on Amazon. I like getting into people's minds in books. I have not read the book (yet), but the movie with Heath Ledger in it is actually quite good in my opinion. Of course, it might take great liberties with the book (I couldn't comment on that yet), but it does tell a story of courage, bravery, and honor regained through very difficult and desperate circumstances. Ethne is one of my favorite names! If we had another daughter, she would be most likely be named Ethne! Apparently the correct Irish pronunciation is Enya (like the singer), but I prefer to pronounce it more phonetically with a short e first and a long e at the end. Interesting. . .I had never heard of it, but your comments about it being a good story that makes you think. . .well, that's right up my alley! And are you on Goodreads, or do you just check it out (as a non-member) for reviews? @Shonya - I AM on Goodreads but I've never really figured it out. Every so often I'll look at it for a review IF I can't find any information about a book elsewhere. Maybe someone on Goodreads will drop a hint of the history of a book or something. That's typically when I check it out.